Ever since I can remember, Christmas goodies of the food type have been a tradition in my family. As a girl my mom would bake and make candy in a whirlwind during the weeks leading up to Christmas. Snickerdoodles, fudge, brittles, caramels and other cookies would line the countertops and pile up on the dining rom table. Oftentimes in the evening after school and work my mom and I would sit at the table and form an assembly line for the caramel wrapping. She would carefully cut each caramel into a little square along with some cellophane and I would wrap each one and add it to a growing pile. The caramels always seemed the most special, possibly because of this ritual we shared every year before I left home, and also the memory of her standing over the stove for an hour, carefully stirring the bubbly, sugary, creamy concoction. It was a labor of love, tending these caramels, for they must be stirred constantly, the heat monitored so as to keep a nice, even bit of bubbling on the top, and as they approach their finished stage, carefully testing them to find just the right moment to take them off the heat. Too short of time and they won't hold their shape, too long, and the caramels turn out so hard, you'd be sending people to the dentist for Christmas. In some ways, it's like a meditation, these caramels, requiring focus and concentration for a period of time. When I left home for college, I remember the first year I had an apartment and kitchen and I asked my mom for the recipe. I wanted to make some caramels for my friends and Adam's family in Kansas and I also think that in a time when I was living far from my mom, this ritual of making the caramels made me feel a little closer to her. That was almost 20 years ago and today I am still making the caramels every year. I thought I'd share the recipe with you in case you want to take a stab at them, the time spent is well worth the buttery deliciousness of them melting in your mouth. Line an 8" x 8" x 2" baking pan with foil or parchment paper, butter it lightly (I like to use the papers from the butter called for in the recipe to do this). If adding walnuts, sprinkle the chopped walnuts on the bottom of the lined pan, set pan aside. In a 3 qt. saucepan melt the 1 c. butter over low heat. Add the brown sugar, light cream, and corn syrup, mix well. Cook over medium-high heat to boiling, stirring constantly with a wooden spoon to dissolve sugar, about 6-8 minutes. Avoid splashing the mixture on the sides of the pan. Carefully clip candy thermometer to the pan. Cook over medium heat, still frequently until candy thermometer registers 248-degrees, firm-ball stage. Mixture should boil at a moderate, steady rate over entire surface. Reaching firm-ball stage should take 45-55 minutes. Remove saucepan from heat; remove thermometer. Immediately stir in vanilla (this part is the best as the vanilla sizzles and releases a plume of the most decadent smell!) Pour the caramel mixture into the prepared pan. When the caramel is firm, use foil/parchment to lift it out of the pan. Use a knife to cut candy into 1-inch squares and wrap each piece in parchment or wax paper. Makes 64 pieces or 2 pounds. Another favorite that I have been making for at least the last 10 years are these ginger snaps, which I think might be an old Williams-Sonoma recipe. They're the perfect compliment to coffee or tea in the afternoon, or even dipped into a good old glass of milk. Preheat oven to 325-degrees, line a baking sheet or two with parchment paper. Sift flour, ginger, baking soda, cinnamon, cloves, salt. In a mixing bowl stir oil, brown sugar, molasses, add whole egg and stir until well blended. Stir in flour mixture until will blended. Stir in chopped, crystalized ginger. Lightly beat egg white and with lightly dampened hands shape dough into 1-inch balls, brush lightly with egg white. Bake until top of cookies are set and cracked, about 15-18 minutes. Cool on a baking sheet. Makes about 4 dozen cookies. The last thing I made for holiday gifting was a new to me recipe from Yotam Ottolenghi's newest book Sweet, which was recently gifted to me. We're big fans of many of his recipes from the Plenty cookbook, so I felt pretty safe throwing in a new to me recipe for our holiday treats. 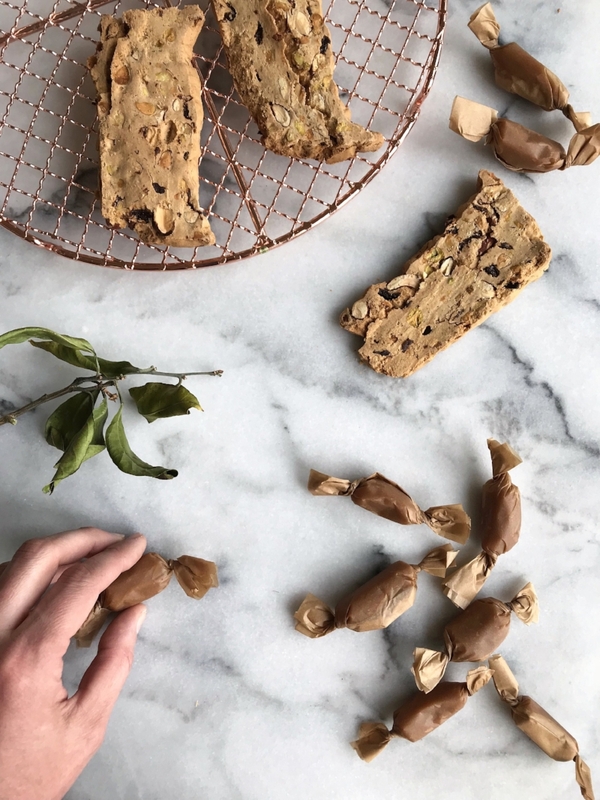 The Almond, Pistachio, and Sour Cherry wafers are another great coffee/tea pairing treat and the mix of fruits and nuts makes for a pretty presentation in your gift boxes. You can find the recipe in his latest book, Sweet, plus many, many more delicious options! Another highlight of this year's baking was this new copper cooling sheet that I treat myself to :) As always, a little bit of beauty in your tools makes everything a little more enjoyable. 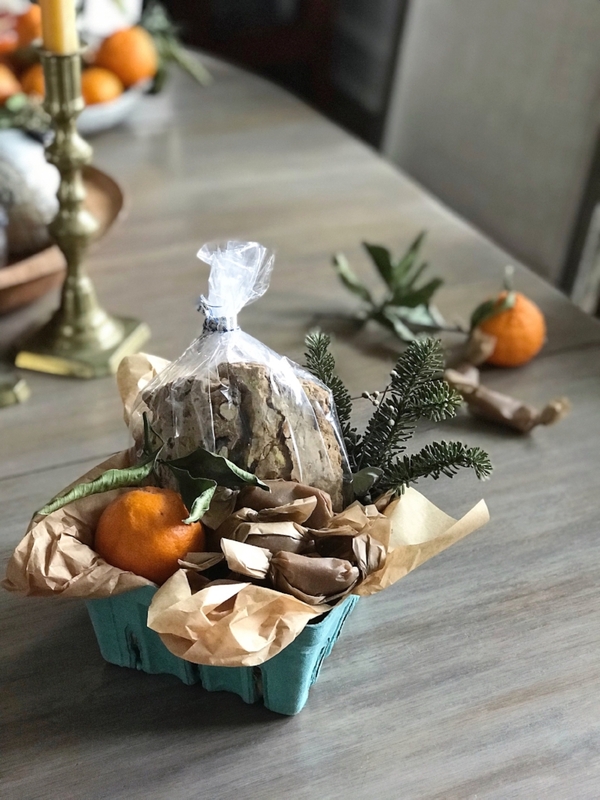 And finally, if you're looking for a simple way to put together a little gift for friends and neighbors, my go to method is a sheet of tissue (a cute scrap of cloth or napkin could work well too) and the fruit and veggie baskets from the grocery or farmer's markets. I usually keep a little stash of these for gift giving during the holidays. Add a little spring of greenery and viola! Our friends and neighbors are always delighted to receive these. If you're looking for that easy, go to recipe for the numerous potluck and holiday events you'll be attending over the next month, this dish is a great option. My friend Grace and I spent an afternoon cooking and styling this delicious meal that takes advantage of the cool seasons bounty of the cruciferous veggies that are plentiful this time of year. Heat oven to 425F. Place parchment paper or aluminum foil on a large rimmed baking sheet and lightly coat with olive oil. Cut cauliflower into bite-sized florets. Spread cauliflower and chopped onion across the baking sheet. Drizzle and toss with olive oil, until lightly coated. Sprinkle with salt and pepper, to season. 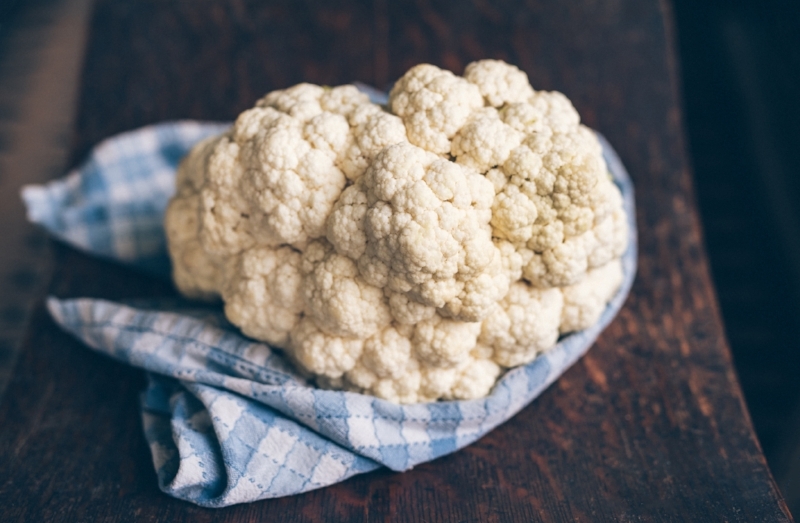 Roast 25-30 minutes, stirring halfway, until the edges are browned and the cauliflower is fork-tender. 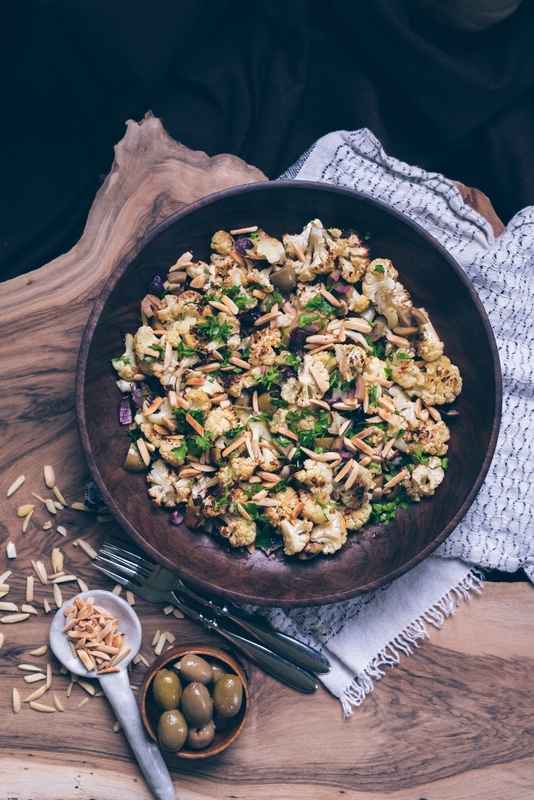 While the cauliflower and onions are roasting, toss the almonds into a dry skillet over medium heat, stirring regularly, until almonds are golden brown and give off a rich, toasty fragrance. 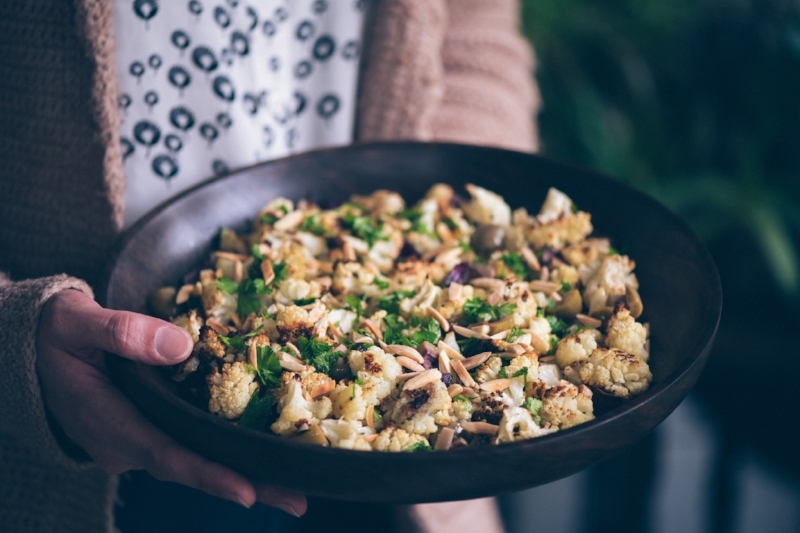 When the roasted cauliflower and onion are done cooking, place in a large bowl. Mix in the olives, raisins and parsley. Sprinkle with the toasted almonds. Serves 4-5 as a side dish. Ah, late summer days when the tomatoes you have been nurturing since the spring are bursting with fruit, their limbs toppling over in exhaustion, despite your best efforts to cage and support them. We've had quite the harvest of tomatoes this season and have been savoring them in so many different ways: soups, pizzas, classic mozzarella and basil drizzled with olive oil and balsamic, and of course, eaten right off the vine. One of our favorite ways of enjoying them as of late is paired with a bit of toast and an herby mascarpone that we've been whipping up on the spot, with a handful of whatever herbs we happen to have going in the garden. While we're no recipe developers, this snack/meal/appetizer is so versatile, simple, fresh, and tasty, we thought we'd share it here. A small handful of herbs, whatever you, your neighbor, or the market has that looks good to you. Slices of your favorite bread, crackers or pita would be great too! I pulled some sage, lemon oregano, and a few tiny basil leaves from the garden. Gather the rest of your ingredients. Chop the herbs finely and then mix in with mascarpone, add salt to taste and if you're feeling adventurous, any other seasonings you prefer, I ended up adding a little garlic to mine. Slice your tomato, give your bread a quick toast on your lowest toaster setting, and cut bread into small pieces, slather a generous helping of herby mascarpone on your chopping board if you're not into getting out a plate and doing too many dishes like I am, our serving boards are great for effortlessly going from kitchen to table. Schmear your bread with herby mascarpone, top with a tomato slice, and enjoy!